Box Text: The truth will change you. 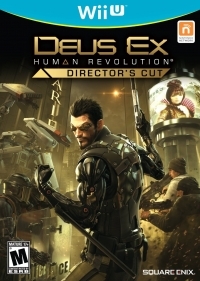 Critically injured after a deadly attack, Adam Jensen undergoes a life-saving operation augmenting him with cybernetics. Caught in the middle of a vast conspiracy, Adam's choices will affect both himself and all humanity as he seeks answer across the globe. Enhanced gameplay : Overhauled boss fights; deeper and more robust combat system. Director's cut features : Miiverse integration, developer commentary, and full in-game guide. 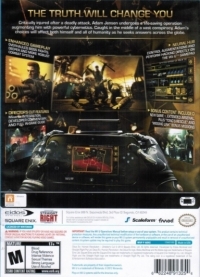 Neutral hub : Control augmentation and perform hacking directly on the Wii U gamepad. Bonus content included : New game +, extended arsenal, plus "Tong's rescue" and "Missing Link" bonus missions. 08-09-2016 Box Text The truth will change you. Critically injured after a deadly attack, Adam Jensen undergoes a life-saving operation augmenting him with cybernetics. Caught in the middle of a vast conspiracy, Adam's choices will affect both himself and all humanity as he seeks answer across the globe. Enhanced gameplay : Overhauled boss fights; deeper and more robust combat system. 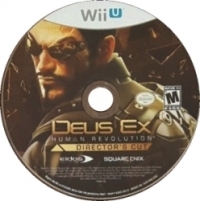 Director's cut features : Miiverse integration, developer commentary, and full in-game guide. Neutral hub : Control augmentation and perform hacking directly on the Wii U gamepad. Bonus content included : New game +, extended arsenal, plus "Tong's rescue" and "Missing Link" bonus missions. This is a list of VGCollect users who have Deus Ex: Human Revolution - Director's Cut in their Collection. This is a list of VGCollect users who have Deus Ex: Human Revolution - Director's Cut in their Sell List. This is a list of VGCollect users who have Deus Ex: Human Revolution - Director's Cut in their Wish List.